WELCOME TO THE DECEMBER EDITION OF THE GO TEXAN ROUND-UP INFOLETTER. As we head into one of the most joyous times of the year, it’s a great time to reflect on God’s many blessings in our lives. I am thankful for you — our GO TEXAN members — who promote, sell and serve the great state of Texas all year round. It is a pleasure for us to serve you and promote what you’re doing. Texas is great because of men and women like you. You have proudly branded your products and services with the GO TEXAN mark, and for that, we are thankful. 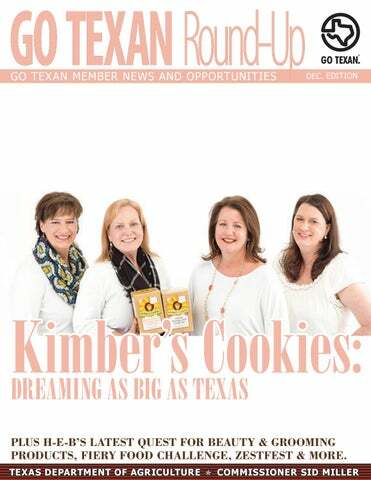 In this issue, we highlight Karen Higginbotham and her labor of love, Kimber’s Cookies. We hope her story inspires you as you see another fellow Texan follow her dreams and make them a reality. Maybe her experience with branding, packaging, co-packing and retail distribution will offer insight on how to combat your present-day challenges with getting your product to market. Don’t forget to contact your regional field rep and ask them for help in getting your product in front of retail buyers and other opportunities that are available from time-to-time. KIMBER’S COOKIES: DREAMING AS BIG AS TEXAS Higginbotham and her team spent an inordinate amount of time sourcing ingredients. They know that consumers today really want to know where their food and ingredients are coming from. Kimber’s Cookies does not skimp in sourcing fresh ingredients of the They achieved this culinary highest quality. delight without using a bunch of preservatives, additives and Kimber’s Cookies are special not just for their ingredients but also how chemicals you can’t pronounce. those ingredients come together to “We had the epiphany to box this make the perfect cookie. mix up and let other would-be bakers enjoy the fresh-from-the- “These cookies are just about oven taste in their own kitchens,” foolproof!” Higginbotham said. “You can bake them for a shorter Higginbotham said. Karen Higginbotham and her three co-founders — Kimber Kadesky, Shirlene Smith and Alison Thomas — worked together to create a boxed cookie mix that’s delicious and achieves that perfect balance between crunchy and chewy. checked it out and soon became proud decided that we had to be included,” members. Higginbotham said. “After looking at the incredible group of For more information on Kimber’s Texan talent in the program, we quickly Cookies, click here. design and current on right. What: Fiery Food Challenge When: Jan. 22-24 Where: Irving Convention Center Details: The most recognized and prestigious blind tasting competition of zesty products in the industry. Deadline for entries is Jan. 8. Contact June DeRousse at (210) 882-0952 for more information. What: ZestFest 2018 When: Jan. 26-28 Where: Irving Convention Center Details: GO TEXAN members are invited to participate as food vendors (and receive a $100 discount on any standard size booth). Contact June DeRousse at (210) 882-0952 for more information. What: Looking for Your Texas Best When: Feb. 2 Where: San Antonio Details: H-E-B is throwing a buyerâ&#x20AC;&#x2122;s meeting to find new hair, skin, oral and body care products. See flyer on page 13 for more information. What: Expo Antad & Alimentaria When: March 6-8, 2018 Where: Guadalajara, Mexico Details: This expo focuses on many new U.S. export product categories that have grown in Mexico, including processed fruit and vegetables, breakfast cereals, condiments, processed meat products, snack items and alcoholic beverages. Registration ends Jan. 5. For more information, contact Carlos Guerrero at (512) 463-6507. What: FOODEX Japan When: March 6-9, 2018 Where: Tokyo, Japan Details: Be a part of the largest food and drink exhibition in Asia. Registration ends Dec. 8. For more information, contact Carlos Guerrero at (512) 463-6507. What: SIAL China When: May 16-18, 2018 Where: Shanghai, China Details: Great interest in tree nuts, dairy, pork, wine and beer. Registration deadline is Feb. 16, 2018. For more information, contact Carlos Guerrero at (512) 463-6507. What: Inbound Trade Mission to Summer Fancy Food Show When: June 27-28, 2018 Where: Texas and New York, NY Details: The premiere event for food products. This opportunity offers pre-arranged matched one-on-one meetings with key buyers, importers, distributors from Europe. For more information, contact Carlos Guerrero at (512) 463-6507. What: Fine Food Australia When: Sep. 10-13, 2018 Where: Melbourne, Australia Details: Industry focus is on food service products, ingredients, natural/ health foods, organic and retail products. For more information, contact Carlos Guerrero at (512) 4636507. What: SIAL Paris When: Oct. 21-25, 2018 Where: Paris, France Details: Every two years, Paris becomes the meeting center for thousands of business visitors from all over the world for this tradeshow. SIAL Paris is one of the largest and most acclaimed food and beverage fairs in the world. Register soon, because this opportunity closes fast. For more information, contact Carlos Guerrero at (512) 4636507. For a complete list of discounted international events, click here. GET READY FOR THE RODEO SEASON APPLICATIONS FOR GO TEXAN MEMBERS WANTING TO SHOWCASE, SAMPLE AND SELL THEIR PRODUCTS AT TEXAS RODEOS ARE COMING SOON! 24 Diner was recommended on Thrillist. Austin Wayne Self was featured on Speedway Digest. Nurture Ranch was featured on CISION PR Newswire in a story about its launching on Amazon Fresh. Pappas Bros. was chosen as the Best Steakhouse in Texas on Thrillist. THE TRADING POST WHERE GO TEXAN MEMBERS CAN BUY, SELL, NETWORK AND TRADE WITH ONE ANOTHER. Your free classified section to advertise your service/product to other members. 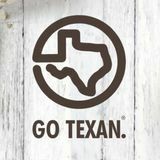 In search of a service or product that a GO TEXAN member already provides? Find it by networking here. If you have something to list here, email the info (50 words or less) to us, and weâ&#x20AC;&#x2122;ll include it here in the next infoletter. Business For Sale: Shrub Drinks is on the cusp of growth with huge potential and opportunity. However, the owners (Cathy Tarasovic and Cynthia Guido) are at the sunset of long professional culinary careers and wish to hand the baton off to someone to take this company to the next level. If you are interested, please visit their website to see if you may be a good fit. For more information, contact Cynthia Guido. STEP grants now online Small businesses across Texas may now apply online for 2017- 2018 State Trade Expansion Program (STEP) grants. Funded through a grant from the U.S. Small Business Administration, STEP aims to increase the number of Texas small businesses exporting to foreign markets and to boost the value of U.S. exported goods and services. Applications will be accepted on a first come, first served basis depending on selected activity and eligibility. For additional details, contact the Texas Department of Agriculture (TDA) Grant Office at Grants@ TexasAgriculture.gov. The shrimp industry plays a critical role in Texasâ&#x20AC;&#x2122; agriculture industry and the economic success of our state. Behind the scenes, youâ&#x20AC;&#x2122;ll find hard-working Texans, operating large boats and navigating miles of clean, coastal waters along the Gulf of Mexico. This is just one of the many reasons why Texas Gulf shrimp is natuarally delicious and better by a nautical mile! Visit gotexan.org to learn more. 1. Rob Barthen 7. Jami McCool 1. Jami McCool 1.Rob 7. 7. Jami McCool RobBarthen Barthen 2. Matt Williams 8. Nelda Barrera 2.Carol Matt Williams Nelda Barrera 2. Faulkenberry Nelda Barrera 3. David Kercheval 8. 8. Eggemeyer 9. Chandra 3. David Kercheval Chandra Eggemeyer 9. 3. David Kercheval 9. Chandra Eggemeyer 4. Darrell Dean Bobo 10. Michelle 5. Manuel Martinez 10.10. CarolBobo Faulkenberry 11. 4.Darrell DarrellDean Dean Michelle 4. Michelle Bobo 6. Kristin Lambrecht11. Carol Faulkenberry 5.Manuel ManuelMartinez Martinez 5. 11. Michelle Esper-Martin [Russ Robertson â&#x20AC;&#x201C; Director] 6.Kristin KristinLambrecht Lambrecht [Russ Robertson - Director] 6.